How to import a plain private key into geth or Mist? This is such a basic question, but I can not figure out how to import a plain, unencrypted private key into geth or mist? I tried geth account import 7[......]bla but it seems this command is always looking for an unencrypted keyfile. Mist has no way to import via GUI, so you need to import using command line (geth). It will show up in your Mist immediately. After successful import, delete the file from your desktop. when you download the mist wallet, you'll get a folder. Inside the folder is where the mist wallet is. After you run the mist wallet, you need to get on cli. Go to /whereveryousavedtheetherumfolder/node/resource/geth/ then run ./geth account import privekey-file.txt. Noting the popularity of this question I went ahead and built a tool such that if you have your raw private key, you can easily convert it into its public key counterpart and the derived Ethereum address. You can then export the key in the appropriate format as defined here such that it can be utilised with Geth or Parity. That said, I think it is worth noting that you should not be working with your private key directly anyway. Your private key controls access to your account. Only use this method for throw-away, testing accounts since your key will be stored in your shell's history (thanks to @tayvano). Not the answer you're looking for? Browse other questions tagged go-ethereum private-key import or ask your own question. How can I make new account by JSON-RPC? What happens if MyEtherWallet will go offline? 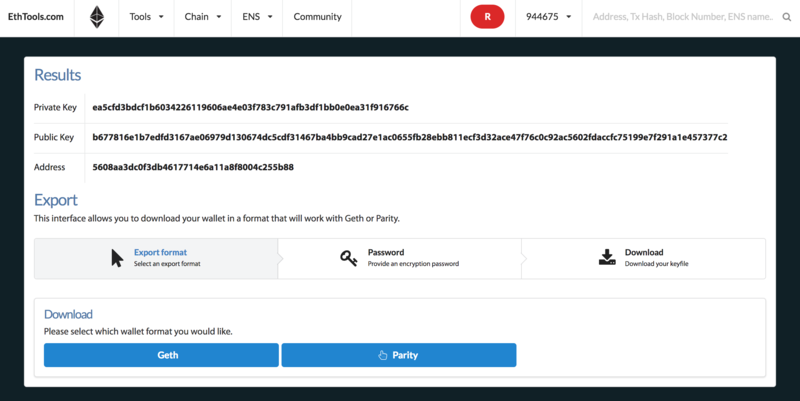 how to import the wallet generated from geth into parity through the passphase?